Swim-up bars are now ubiquitous. But how and where did the idea first originate? Aaron Goldfarb on how the swim-up bar became a symbol of relaxation culture, from Montego Bay to midtown Manhattan. The swim-up bar is pretty much clickbait incarnate. Just ask your browser: “Coolest Swim-Up Bars in the World” (Travel + Leisure) “18 Resorts and Hotels With the Most Amazing Swim-Up Bars” (Trips to Discover), “12 Best Swim-Up Bars Around the World” (Travel Channel), “The World’s Most Enticing Swim-Up Bars” (Paste). 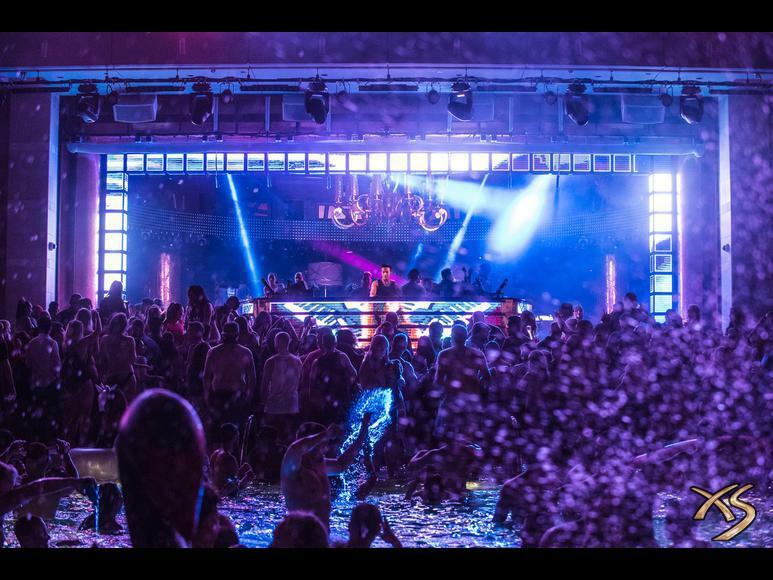 “It says something about a hotel and casino when the pool is one of its sickest, most sought after attractions,” Thrillist notes in their entry into the crowded field of swim-up bar reporting. Yet, for all of the “coolest,” “most incredible,” “sexiest” slideshows of swim-up bars the world over, it’s a lot harder to figure out where the hell they originated. When exactly did people decide they wanted to sip frozen Margaritas on a submerged bar stool? Like most seemingly misguided drinking trends, the swim-up bar was born in—you know it—Las Vegas. As architect Stefan Al explains in his recent book The Strip: Las Vegas and the Architecture of the American Dream, the initial goal of Las Vegas developers was “to seep gambling into a suburban vacation.” Swimming pools grew tenfold in the U.S. during the early-1950s, becoming a requisite hotel attraction. It was only a matter of time before someone tried to mash up legalized gambling and pool-going. 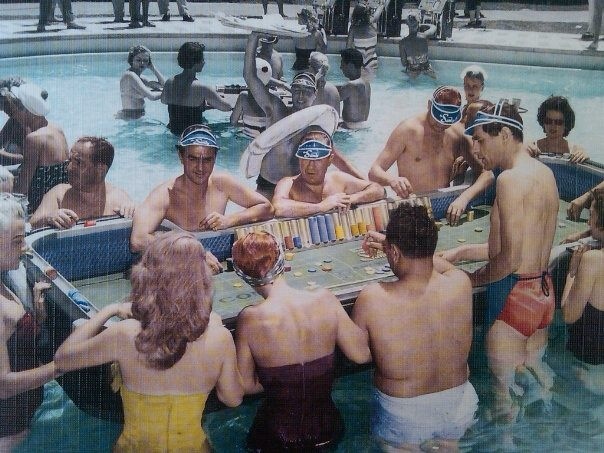 Just after opening, in 1952, The Sands Hotel and Casino launched floating craps and blackjack tables, as well as poolside slot machines, as a gimmicky way to garner press coverage. It worked: in 1954 the casino landed a spread in Life magazine. Other hotels took note. When the Tropicana opened at the other end of the strip, in 1957, the pool area quickly added “swim-up” blackjack tables and tiki drinks in an attempt to combat the loss of summer revenue from guests hanging out in the pool as opposed to the casino floor. It turned out to be a match made in paradise. “These days in Las Vegas, the bar and the pool have truly become a hybrid,” Al told me over email, “with entire pool clubs, such as XS in Encore, among the top 10 world’s highest-grossing nightclubs, because they can get revenue during the day as well as the night.” In actuality, buoyed by frequent poolside “nightswim” performances by musicians such as Laidback Luke, XS has been the number one highest-grossing bar in the entire world the last five years running. However, today’s more archetypal swim-up bars—with their signature submerged stools and comically-named drinks—are more closely associated with Mexican and Caribbean resorts, favored by the same folks who enjoy Carnival cruises and the ring of “all-inclusive.” Credit for this breed of swim-up boozing goes to the Jamaica-based Sandals Resorts. Originally, Sandals’ Montego Bay flagship location (which opened in 1981) only served beachside cocktails to guests who didn’t want to leave the ocean. But when a new block of rooms was added away from the beachfront in 1984, management decided to build something that might attract guests to that end of the property. Architect Evan Williams casually remarked to Sandals chairman Gordon “Butch” Stewart that he “never understood why you couldn’t have bars in pools.” Recognizing a potentially lucrative idea, Stewart promptly gave Williams the go-ahead to build the Caribbean’s first swim-up pool bar. It was an immediate hit; today, all 16 Sandals resorts sport swim-up bars serving drinks like the rum cream-backed Hummingbird and the Dirty Banana. Less a trend than a resort necessity, swim-up bars have become an indelible part of relaxation culture, spreading beyond well-trodden vacation spots. Des Moines, Iowa, has a swim-up bar. Last summer, Nebraska got the state’s first at the Fun-Plex Waterpark. The famed Wisconsin Dells (“The Waterpark Capital of the World!”) has two: Margarita’s Swim-Up Bar at the Wilderness Resort and Mud Hut Swim-Up Bar at the Kalahari Resort (with both places serving 42-ounce “monster” drinks in souvenir cups). And you’d better believe the Jersey Shore has a swim-up tiki hut. Unsurprisingly, the swim-up bar has also been co-opted by private citizens looking for a snazzy McMansion amenity. For the less financially-solvent among us, there are a few inflatable swim-up bars out there, which are probably more fun than a few twenties should buy you. But nothing really beats drinking Mudslides in lukewarm water alongside middle-American moms and dudes with barbed wire tattoos. It has its risks, though. While Tropicana’s pool bar was shut down in 2015 for a litany of predictable health hazards, there is a more benign, but ubiquitous issue, according to Bauer. The Ice Bar Cometh, But Why?